This grass-fed iberico ham is obtained from the hind limbs of the iberico pig. It's characterized by its stylized form, the black hoof and the marbling infiltrating the succulent meat. The colour is red with pinkish hues, and the flavour is prolonged, intense and utterly unique. In Spanish, it's known as, "Jamón ibérico de cebo de campo Revisan Ibéricos entero." 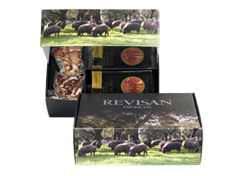 Format : This grass-fed iberian ham is delivered in a box, wrapped in protective paper and a black cotton sack, with red mesh. Storage : This grass-fed iberian ham should be stored in a cool, dry place, out of direct sunlight.